Cut car keys quickly and easily with this automatic machine! Meet the Xhorse Condor XC-Mini, also known as the Condor Mini – which is now available at CitySafe! It’s an automatic key cutting machine designed to cut car keys and it’s the perfect addition to any locksmith business, trade counter or key cutting service. This electronic key cutting machine comes with a built-in database which has accurate and detailed parameters of the most popular car keys on the market so you’ll be ready for any job that comes your way. You can also add your own keys to the database if you wish. It’s equipped with a user-friendly 7″ touchscreen and an intuitive interface which will allow you to easily search the key database and use your key machine. This fantastic key cutting machine is also super fast – it boots instantly and you’ll be able to quickly cut your customer’s key. Use the built-in database to search for your customer’s vehicle make and model to cut them a new key. Cut by bitting. Before entering the cuts you can search the database to select the correct key blank, key type and vehicle manufacturer. Find bitting. If some of the cuts are missing you can use the database to find the full bitting. Simply enter the known cuts to get all possible bitting. Condor Mini is a lightweight stand-alone machine. Because you don’t have to connect it to a computer it’s even ideal for your van and small shop – you can even use it for emergency calls and roadside jobs! You will receive regular online updates for your key machine, helping you stay ahead of your competitors and it’s even available in over 15 languages! 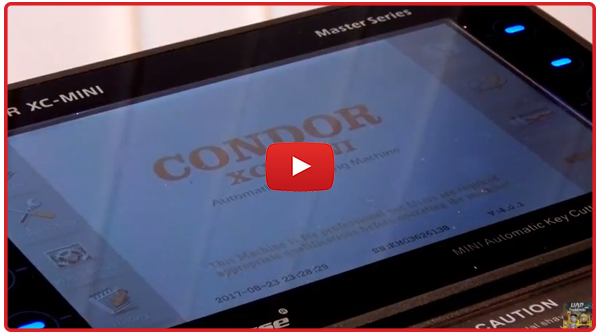 When you purchase the Condor Mini you will get 1 year subscription to InstaCode! Check out our video to see how easy the Condor Mini is to use! Previous Previous post: Get a FREE Door Viewer with Door Security Bundles! Next Next post: Kitemarked British Standard Mortice Locks from £5.50+VAT!